This document gives a few suggestions to analyse a dataset composed by two ordered numeric variables. 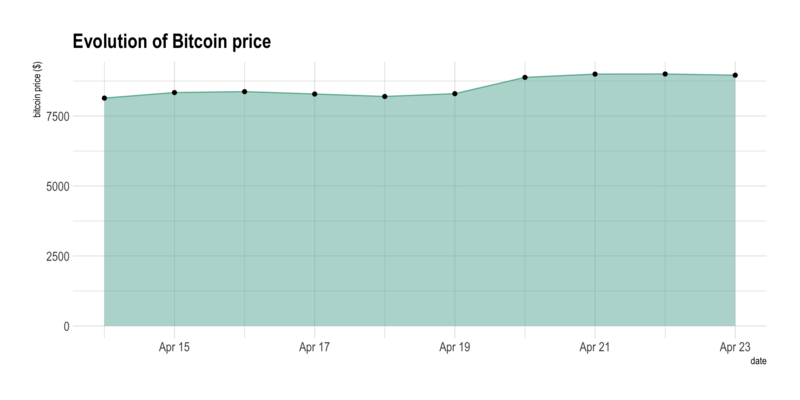 It considers the evolution of the bitcoin price between April 2013 and April 2018. 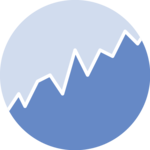 This dataset has been built using the crypto R package that allows to access the CoinMarketCap website. The first column, date, represents an ordered numeric variable. 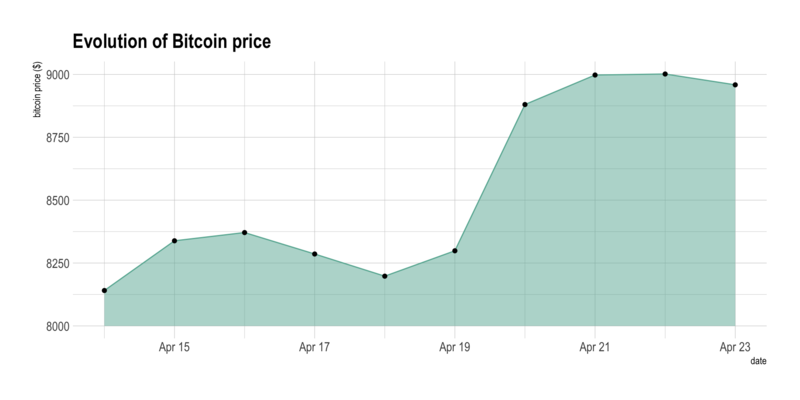 The second, value gives the bitcoin price. This dataset is available on github. The most comon way to represent that kind of dataset is probably to produce a line plot. 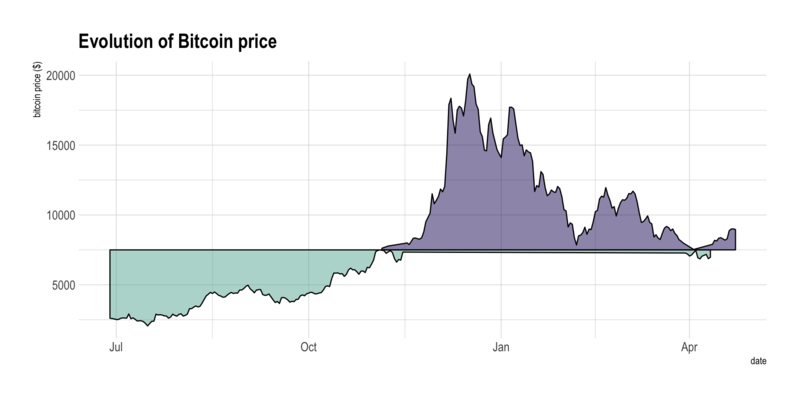 It allows to give a good overview of the bitcoin price on the period, reaching a value of 20,000 $ in december 2017. 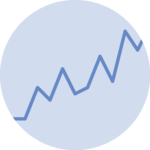 Even if the line chart is a very good way to convey the information, when only one variable is represented like here, the plot can appear to be slightly empty. Thus, an interesting alternative is the area chart. It is basically the same thing, except that the area between the X axis and the line is filled. Note that using the same color for the filled area and the line is often a good looking choice, with a bit more transparency for the filled area. 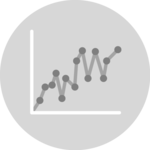 Using interactivity gives a great added value to your line or area chart. Indeed, it is very useful to ba able to zoom on a specific time slot of interest on the graphic. 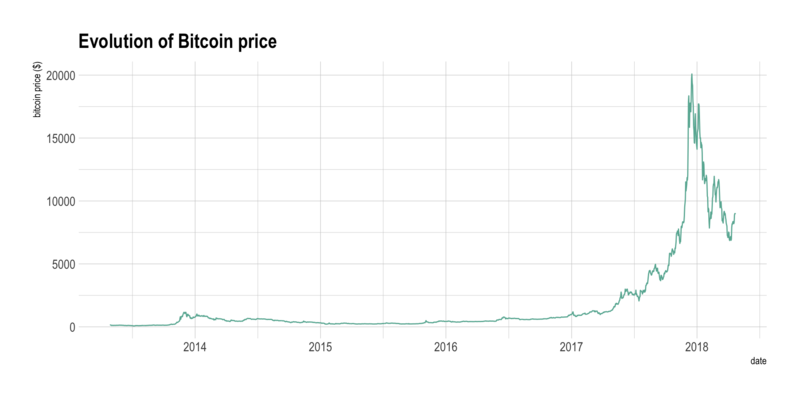 For instance, have a look to what happened in 2014: bitcoin already experienced a huge evolution, comparable to 2017 in terme of relative evolution, but not mediatised at all. The previous chart can be a bit frustrating. 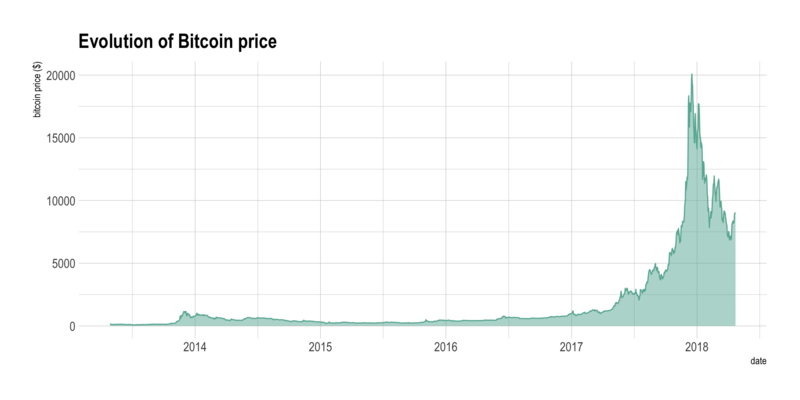 It is indeed hard to study the evolution of the bitcoin in this graphic since the price ranges between 7,500 and 10,000 dollars in this period, when the Y axis ranges between 0 and 10,000. In this case, it is a good practice to cut the Y axis to zoom on the variation. This subject is subject to many debates in the dataviz community and you can read more about it in the dedicated page.